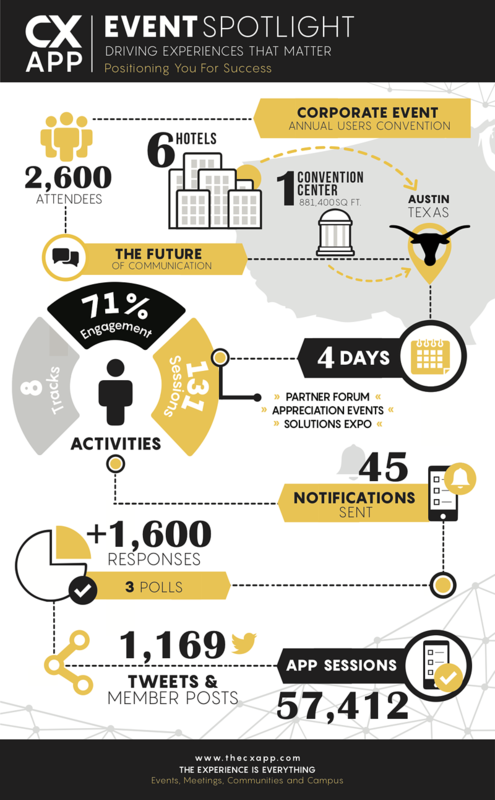 The CXApp team kicked off 2019 with a four day event in Austin, TX - the live music capital of the world. We were on-site along with 2,615 other attendees: customers, partners, employees, vendors, sponsors, and investors of a prominent tech company focused on the future of communication. Attendees traveled from all over the globe and converged across six local hotels into one convention center for the action-packed event. CXApp users were able to play the “Klik Experience Game”, where they had the chance to win prizes, network, and get a list of contacts. Our integration with Klik means that attendee badges effectively become wearable tech devices that light up at key times, stimulate networking by syncing with other badges to exchange contacts and encourage engagement by making games possible. It’s a marriage made in tech heaven. The eight different agenda tracks and 131 breakout sessions exploring topics such as AI, Cloud Technology, Customer Experience, and Digital Transformation (to name a few) kept everyone busy. In addition, we had the opportunity to check out the “Solutions Expo Experience Theater”, which provided a platform for sponsors to discuss their new products or solutions and for attendees to connect (you guessed it - by Klik) with representatives and other guests in order to earn badges for the Klik Experience Game. Our stay in lively Austin ended with an appreciation event where we mingled with friends and acquaintances while enjoying authentic local cuisine and 10 live bands across three stages. Inspired by the vibrant entertainment and culture, this event created a soundtrack all it’s own and you can bet we’ll be back next year … if not just for the Southern hospitality!